Post: While it would be easy enough to parlay my new right-sized toaster into more discussion of the virtues of single piece part and information flow at the front lines, let’s consider instead the “work in process” for managers. Especially in the last decade, it seems to me that managers have become buried in administrative WIP — projects and objectives. Infinite loading of managers is the norm: give them a hundred projects and ask them to spend 1% of their time on each — just like on the factory floor, we figure if we keep pushing work in, something will eventually come out. We launch many objectives and then expedite the hot ones – and hot unfortunately usually means most urgent, not most important. Managers are rewarded for stamping out the fires, for working long hours to keep up, and for juggling too many ‘priorities.’ Loaded down like Santas we have to decide on a moment’s notice “who’s naughty and nice,” who gets help, what is the best short-term solution. We may be preaching one-by-one production to the shop floor, but we are often victims ourselves of way too much manager work in process. I had a boss many years ago who would call me to his office almost daily to lecture me: “Project X is your number one priority, I want you to spend 100% of your time on it!” The following day I’d receive a similar message, but this time for a different project. After trying to juggle too many priorities for a while, I just learned to fake it – to pretend things were happening even when they weren’t – since it was virtually impossible to handle all of my manager WIP. Ultimately, when we overburden managers, we make them bad managers. 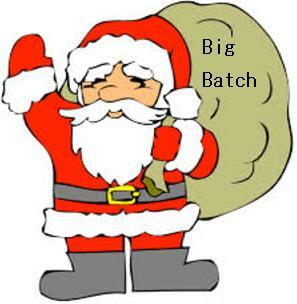 This being the holiday season and my last post for 2013, I like to suggest to managers that next year you give your direct reports and yourself the gift of one-by-one projects – or at least smaller batches. Focus on less at a time, get some balance in your life, and the flow will improve. Less WIP, greater velocity. Thanks for reading and commenting this year; hope to have you back in 2014. BTW. Please Join me on January 14 from 3:00 p.m. to 3:45 p.m. for a free “Tea Time with the Toast Dude” Webinar. Next month’s topic will be “Value Stream Mapping Mistakes and Faux Pas.” You can register on our website: go to www.gbmp.org and click on Events. This entry was posted in Old Lean Dude and tagged 1x1 processing, bruce hamilton, kaizen, lean leadership, lean manager, Management Kaizen, Old Lean Dude, Toast Kaizen, work in process on December 19, 2013 by GBMP. Love the video! Love the improvement challenge on administrative WIP. Guilty as charged – hoping to do better in 2014. Thanks for all your great ideas, Bruce!